At last a new solo album by the queen of fragile and poetic electro-pop - now introducing the piano. It's three years since Barbara Morgensterns acclaimed album Nichts Muss and as The Grass is always greener goes to show, she has come a long way. Her Goethe Institut sponsored world tour and many recent collaborations with, among others, Robert Lippok and Bill Wells have cleary been an inspiration for this album. Morgensterns music has gained a bold maturity. Her unmistakeable voice and warm piano style make for an unique sound. 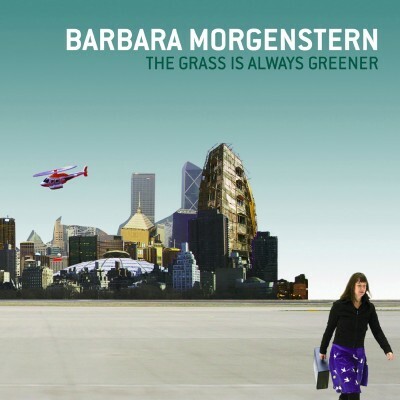 This album is the perfection of minimal elegance.BARBARA MORGENSTERN ON THE GRASS IS ALWAYS GREENER "The Grass is always greener" is part of an old english saying which expresses the idea that things are always better some other place rather than where one is at the time. Through the Goethe Institute sponsored world tour I did together with Maximillian Hecker in 2003/04 I had the opportunity to find out if the grass really is greener "On the other Side". Experiencing so many places, different cultures, people and languages in such a short time (far too short a time to take it all in) is absolutely intoxicating and of course perfect material for a new record. Some pieces have to do with the various impressions I gathered while on tour. "The Grass is always greener" came about in San Fransisco. "Das schoene Einheitsbild" (trans. Beautiful Picture of Unity) is an attempt to explain to myself why blonde haired women and MacDonalds fast food stands for the highest form of culture worldwide. "Mailand" of course came about in Milan (Mailand being German for Milan). "Die japanische Schranke" (trans. japanese railway gate) comes from the squeaking sound of railway gates I heard in Tokyo. "Polar" is the simple observation that even in moments of the utmost apparent luck (going on a world tour) one can still be unhappy. Another song that has to do with the idea that it's always better in some other place is "Unser Mann aus Hollywood" (trans. our man from hollywood). This is a short story about an unhappy dream. "Juist", the first track composed after the tour, takes its name from the car-free German island in the north see where we went on holiday having completed the round the world tour - it was just right having come from cities like Bombay and Bankok. Naturally, some tracks also came about far removed from any journeys or world tour experiences. "Alles was lebt bewegt sich" (trans. all life is in motion) is a reply to an interview that had to do mainly with growing old, the development of electronic music, eternal youth and the particular difficulties these phases bring with them. This is for me an outdated discussion which visibly annoys me. So my statement on the debate is: "Alles was lebt bewegt sich" (trans. all life is in motion). "Quality Time" is about similar themes - time and the ability of enjoying it. The spark which started of this piece was however a documentary film which had followed jazz musicians from diverse countries on a concert tour through africa. They visited many states and played with the local musicians in each place. The music impressed me with its repetitiveness and wonderful simplicity of the melody. One final piece that deals with the concept of time is, as the title suggests, "Ein paar Sekunden" (trans. a few seconds). The idea has always fascinated me that it could all suddenly be over for you if you make the wrong split-second decision in your car, in the street or just about anywhere. Initials B.M. has parallels to Brigitte Bardot and Serge Gainsbourg. After all, one has to position one's self somewhere. So the album deals to a large degree with the world tour but also with the phenomenon of time and the change it brings with it. Perhaps this is not great surprise when I think that we were jetting through time zones and sooner or later we lost all feeling for the passing of time.